One of the best articles I read this week was Urban habitats ‘provide haven’ for bees on the BBC. 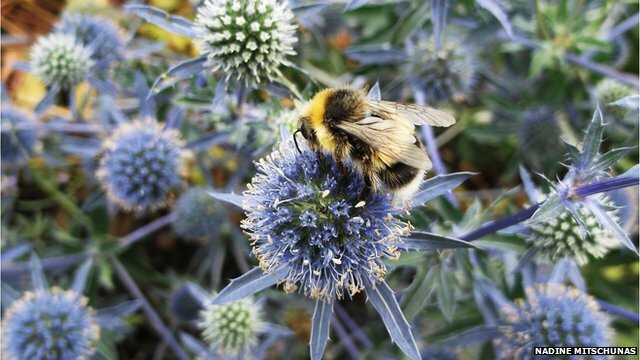 It outlined how urban centres in the UK are home to more kinds of bee than farmlands are – largely as a result of the flowers and plants in our gardens and allotments. So a big pat on the back for us gardeners! There’s loads more we can do though to ensure the bumblebees don’t go hungry and to encourage them to visit us as we work. The Bumblebee Conservation Trust website is a great resource. Why not find out how bumblebee friendly your garden currently is by doing their online quiz – How bee friendly is your garden? As we move into the warmer weather and start to see more bees buzzing around, you can take part in the Great British Bee Count starting on May 1st– last year you could download a great app onto your phone which allowed you to identify and log the kind of bees you were seeing in your garden. You can sign up now to take part this year. As a gardener I know that bumblebees are an important and cherished component of our biodiversity. With lots of species sadly under threat, it’s important all of us do what we can do protect these fluffy helpful insects – we need them to pollinate our flowers after all! Find out more about how to ‘bee-friend’ your garden by downloading this Waitrose app onto your iphone or android.